This Sunday, our readings focus on the great banquet, which is the traditional symbol for the final salvation. In our first reading (Isaiah 25:6-10), the prophet Isaiah foretells of the end times when the final salvation on Mt Zion will be like a banquet beyond anything imaginable on earth, a time when all peoples will be joined together and every tear will be wiped away. On this mountain the LORD of hosts will provide for all peoples a feast of rich food and choice wines, juicy, rich food and pure, choice wines. On this mountain he will destroy the veil that veils all peoples, the web that is woven over all nations; he will destroy death forever. The Lord GOD will wipe away the tears from every face; the reproach of his people he will remove from the whole earth; for the LORD has spoken. On that day it will be said: "Behold our God, to whom we looked to save us! This is the LORD for whom we looked; let us rejoice and be glad that he has saved us!" For the hand of the LORD will rest on this mountain. Our Gospel reading (Matthew 22:1-14) takes place during Jesus' final passion week. Jesus chastised the Jewish leaders with the third parable in a row about their failure to welcome and believe in the Messiah. In this parable, the king (God) holds a wedding feast for his son (Jesus). He sent his servants (the prophets) but they were rejected and killed. In anger, the king destroys their city and invites everyone who will come, good and bad alike. Jesus again in reply spoke to the chief priests and elders of the people in parables, saying, "The kingdom of heaven may be likened to a king who gave a wedding feast for his son. He dispatched his servants to summon the invited guests to the feast, but they refused to come. A second time he sent other servants, saying, 'Tell those invited: "Behold, I have prepared my banquet, my calves and fattened cattle are killed, and everything is ready; come to the feast."' Some ignored the invitation and went away, one to his farm, another to his business. The rest laid hold of his servants, mistreated them, and killed them. The king was enraged and sent his troops, destroyed those murderers, and burned their city. Then he said to his servants, 'The feast is ready, but those who were invited were not worthy to come. Go out, therefore, into the main roads and invite to the feast whomever you find.' The servants went out into the streets and gathered all they found, bad and good alike, and the hall was filled with guests. 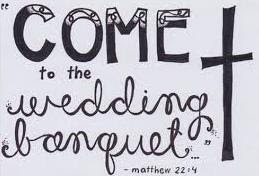 But when the king came in to meet the guests, he saw a man there not dressed in a wedding garment. The king said to him, 'My friend, how is it that you came in here without a wedding garment?' But he was reduced to silence. Then the king said to his attendants, 'Bind his hands and feet, and cast him into the darkness outside, where there will be wailing and grinding of teeth.' Many are invited, but few are chosen." In our Epistle reading (Philippians 4:12-14, 19-20), St. Paul concludes his letter to the church in Philippi by teaching that in Christ, rich and poor are the same. When we put on Christ, we all have the "glorious riches in Christ Jesus". Brothers and sisters: I know how to live in humble circumstances; I know also how to live with abundance. In every circumstance and in all things I have learned the secret of being well fed and of going hungry, of living in abundance and of being in need. I can do all things in him who strengthens me. Still, it was kind of you to share in my distress. My God will fully supply whatever you need, in accord with his glorious riches in Christ Jesus. To our God and Father, glory forever and ever. Amen. Our Gospel passage concludes with a seemingly odd story of the man without the wedding garment being cast into the darkness. It's important to know the symbolism of this message. First, the wedding host would have supplied the garment to be worn. Secondly, the garment can be seen to represent the gift of baptism, and wearing the garment to represent putting on Christ - living the baptismal promises. And so it is with the garment of our own baptism. Do we put on Christ, do we keep Christ on in our daily living?